In the land of a Thousand Smiles | Beyond "he" and "she"
Ten days already in The Land of Smiles: a name that I most times find perfectly accurate but then tuk tuks and motorcycles happen… The smile is an integral part of the Thai body language. The acute intonation of the chanting greeting: Sawatdee Kaaaa goes along with a nice smile, hands to the chin and a slight bow in sign of respect. The tone is never too high, being polite is intrinsic to Thai linguistics and sometimes the foreigner is considered loud and extravagant. The food is alway a delicious surprise. For 30 baht (less than a dollar) you can eat delicious Pad Thais, Pad Kra Pao, ramens, curries… my belly has been very happy these days. I had a beautiful reconciliation with Mango which, I used to find meh just alright… but here, mangos are absolutely perfect. I now have a little routine. I live in a small guesthouse about 15 minutes from work. Every day, I stop in my favorite coffee shop and walk to the office that is a very green and pretty house, once a bird sanctuary. Shoes are left at the entrance where there is a nice showroom of products made by women in refugee camps in the Thai-Burma border. My desk is on the first floor next to the terrace and very close to the fan to be able to work at 35 C°. The project is amazing. WEAVE works with women from five refugee camps to expand their product line in sewing, weaving and bordering. Products are beautiful, multiple colors and textiles, clothes, handicrafts and home decorations. Since the women cannot leave the camps as per Thailand’s regulations, the organization helps them to sell their projects locally and internationally and 100% of the work is paid to the women when they deliver the product. WEAVE also organizes educational forums and different events for the women and kids living in the camps. Teachers and heads of the programs are mostly refugee women or local people living in the area. I am the only “westerner” in the organization in Chiang Mai. The reliance on mostly “locals”, may be part of the reason for the success of the project. I am now working in the media and communication area. I will soon be going to the refugee camps to do press releases, articles and work with a website developer to revamp the site and create the online shop for the social enterprise. I will also do an evaluation of the fair trade program to see opportunities of improvement and expansion. I am really excited about the work. The beauty of Chiang Mai is not as obvious as I thought. There are more motorbikes than humans. Pedestrians are at the bottom of the city’s mobility hierarchy. Without any right to claim their own, bikes, cars, vans, tuk tuks (motorbike taxis), rot daengs (tiny buses) and any other wheeled vehicle has the right of way before you little pedestrian. To go to work I have to cross a wide and busy street, Huay Kaew Rd. After a mile I find 1 TRAFFIC LIGHT and a crosswalk! There is a little button for pedestrians, YAY! But, as it turns green, RUN! You only have 8 seconds! And you lose about 5 seconds as many cars decide not to stop. Plus, Thais drive left, on the English side, so it’s another complication: nothing ever pops up on the side you are expecting it. The other day at that same intersection waiting for the light to turn green, I decided to impose myself with a stern face demanding my pedestrian rights. I started to walk even though cars had not stopped yet, when a European old man said to me: “Do not EVER trust them”. So that’s that, crossing the street is like being in a Nintendo game and requires significant expertise. The curfew and coup d’état have not been felt at all. You have to be indoors from 12 to 4:00 a.m. but I have not seen many soldiers; maybe a few at the Sunday market but no aggressivity is perceived. They are already lifting the curfew in certain cities of the south and, locals say that there is nothing out of the ordinary as this is not the first coup d’état… or the last… I guess there are way more arguments and theories about it but this is what is perceived on the surface. 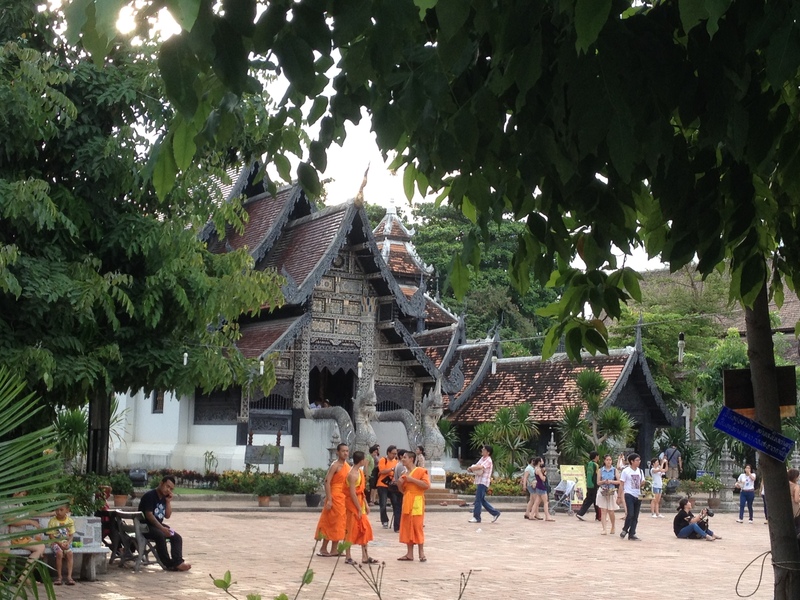 As you explore the city of Chiang Mai you start to understand its hidden charm. There are beautiful temples every two blocks: all very different, some are golden and a bit overdone, the Thai bling bling, but others are made of precious wood. Now is the rainy season, the Monsoon, and it’s very beautiful. The downpours resemble Mexico’s, the sky is falling for a few hours and then it’s magically over and the sky is blue and nice the rest of day. Rainfalls explode at some point of the day, and you have to find a shelter somewhere, end up talking to a bunch of people in the same situation in a coffee or small bar … These are forced breaks in the day happening unexpectedly but always appreciated. The walking markets are really agreeable and the tropical “beach without a beach” atmosphere sets up a very unique light and chilled mood in the city. There is a very large community of farangs (foreigners) living in Chiang Mai and a local / foreigner coexistence seems to be happening in the entire city without a specific tourist-only zone. So far, what I’ve learned of Thai culture is to live softly. They warn you as soon as you land here to be very cautious and avoid any confrontation … The most common words in the everyday Thai life are “it’s up to you”, “suuuure, sure” Sabai Sabai (relaaaax) … you have to avoid at all costs to make someone “lose his face” which refers to exposing people or putting someone in an awkward situation … never get angry in public, do not show your emotions and do not EVER cry! 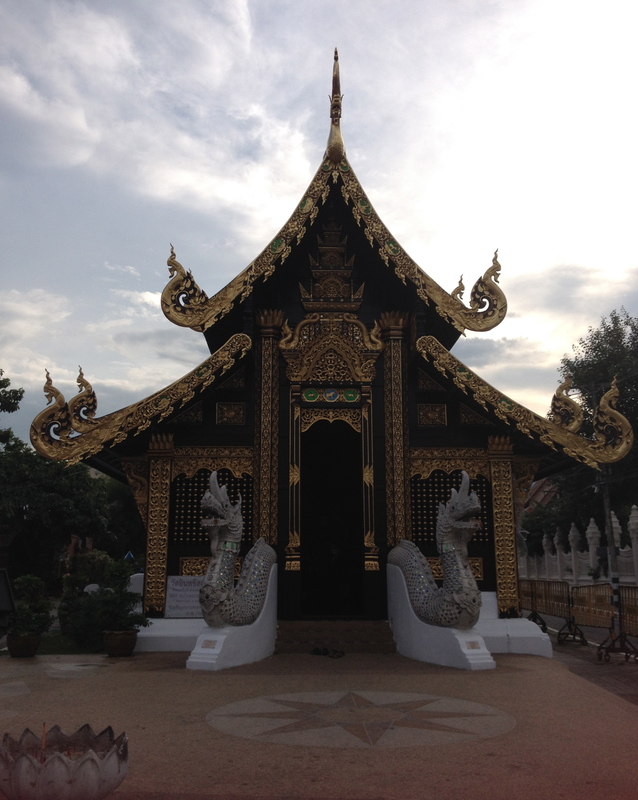 These are my first impressions of beautiful Chiang Mai. I would love to speak the language. We will see. It has been pretty amazing so far. This week: Mae La refugee camp. Forget the two words of thai you just learned and try Karen, Karenni and Burmese!